Our skin is the body’s largest organ and the only one exposed to all the vicissitudes of the environment. It must tolerate solar radiation, changes in temperature and relative humidity, oxidation (by oxygen, ozone and some chemicals), bacterial and fungal attacks, physical injuries (insect bites, cuts and bruises), allergens and numerous air pollutants. Aside from obvious cosmetic aspects, the primary function of the skin is to form a barrier that acts to conserve body moisture. To do this effectively, the skin has evolved into a complex, multi-layered, flexible sheath, ranging from about 100 microns to many times thicker in work-response (callused) areas. There are nine species of our epidermis, such as the palms, lips and eyelids. The uppermost layer of our skin is the Stratum Corneum (SC). It is only 5–10 microns thick, and until about 1950 was thought to be dead tissue. Indeed, the very top portion continuously flakes off, almost unnoticeably, as the skin slowly rejuvenates itself, typically about once per month. Currently, dermatologists recognize that the SC plays a critical role in skin health. It is the primary target of innumerable personal care and pharmacological products, generally called emollients, moisturizers or humectants. They are used to increase the moisture level of the SC to about 20 to 30%, making it smoother, softer, more flexible and supple, as well as free of fissures, itching and excessive flaking. By doing so, these products counteract the problems caused by dry skin (xeroderma), where the moisture content of the SC amounts to 10% or less. Dry skin is found in as many as 90% of adults. When the skin is under stress, it becomes unsightly, developing tiny protrusions (“sandpaper syndrome”), and sometimes blotchy red-brown pigmentations, especially on the arms and lower legs. Itching can be a significant problem. Dry skin disorders increase with advancing age and can be more troublesome in winter months where the relative humidity is low. The U.S. market for emollients was about $9 billion in 2008 and is projected to be about $15 billion in 2018. It consists principally of oil-in-water (o/w) creams, lotions and gels, delivered using plastic dispensers. Aerosols have limited penetration, but this is increasing. While dry skin problems are most prevalent, there are a large number of other ailments and diseases that challenge the skin. Some are easily tolerated, while others, such as melanoma, can be life threatening. In many cases their origin is unknown, and methods for their eradication are also unknown. We must be satisfied by mitigating them or tolerating them. Table One lists a number of them, and their current incident frequency in the U.S. population. 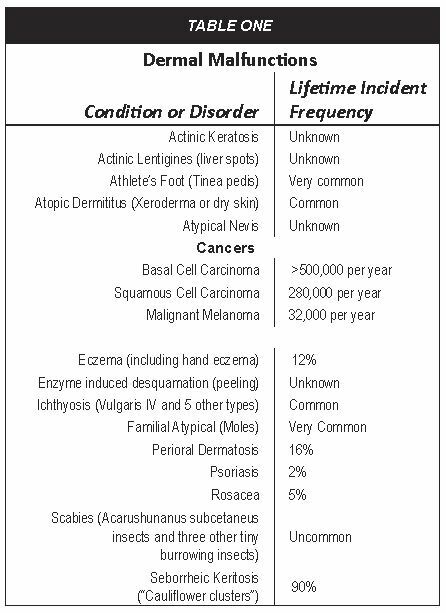 In addition to this partial listing, there are incidents such as cuts, bruises, animal and insect bites, burns, allergen contacts, UV-A and UV-B radiation, defatting or corrosive chemical contacts and other exposures that can damage the functionality and appearance of skin. We have learned how to cope with at least some of these challenges. Visits to a dermatologist every six months or so are important in both identifying and coping with certain skin problems. Offending cancerous sites can be treated by cryotherapy (nitrosol freezing) or surgical procedures. For the very common dry skin problems, daily treatment with formulated emollients or moisturizers can be very beneficial. Surveys suggest that over 90% of women and many men utilize these products on a regular basis. The terms “moisturizer” and “humectant” imply products that increase the hydration of the SC, making it softer and more flexible (marketers often claim “making it clear”). The signal word “moisturizer” is more immediately understood and persuasive to consumers than other terms, so it often has a dominant role on product labeling. The more medical term “emollient” is less conspicuous, although it connotes a broader set of benefits. An emollient is included in water-based formulations, such as oil-in-water (o/w) or water-in-oil (w/o) emulsions, lotions, ointments and creams. It has three primary functions: by holding the water portion against the treated skin, the SC is hydrated; the emollient acts to reduce the trans-epidermal water loss (TEWL) rate by forming a lipid layer on the skin surface (the occlusive action of the product enhances hydration of the SC); and lastly, emollients can effectively bind water rising from deeper parts of the dermis. The result of daily or twice-daily applications is that dry skin (xerodermis), psoriasis and some other skin problems are mitigated or even eliminated. The skin looks smoother, with reduced wrinkling. Corneocyte flaking is suppressed and the skin becomes more flexible and less prone to possible fissuring at stress locales. Clinically, a moisturizer does not form a lipid film on the dermal surface to reduce the TEWL. It operates within the skin to conserve moisture, utilizing processes only partly understood. The most important example is propylene glycol, found in numerous skin care formulations. Monotherapy of emollients and moisturizers is historic, but never utilized in modern multi-functional products. As a consequence, the term moisturizer (or humectant) has taken on a broader denotation, being applied to complex formulations of multi-therapeutic products that elevate the SC water content. Indeed, one French moisturizer has been reported that contains 83 ingredients. Well over 100 chemical compounds have been found in the SC. Some formulators have felt it is useful to enhance the concentrations of some of them by including one or more in skin care products. 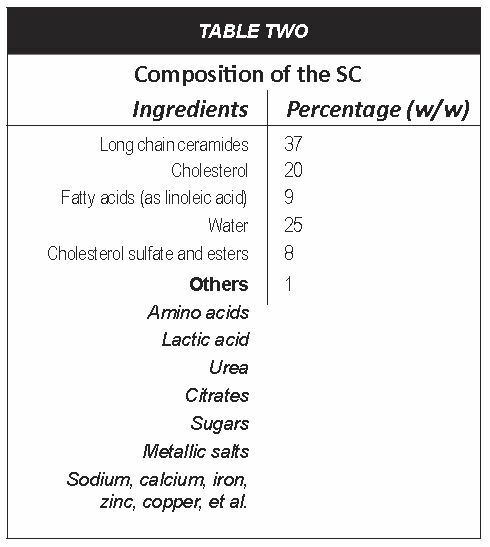 On a microscopic level, the SC does not have a uniform composition from one part of its structure to another. Consequently, the data in Table Two can be misleading in some ways. A fairly large number of emollients are utilized in skin care products. The gold standard is isopropyl myristate (IPM). Useful emollients are lipids that are generally liquid, odorless, colorless, non-irritating and very slow to evaporate. Esters are often utilized. They must not impart a sensation of oiliness, greasiness or stickiness. The rate of hydrolysis must be negligible, since the released components might include solids or irritating carboxylic acids. The natural animal, vegetable or fish-based triglycerides (which all contain unsaturated segments, like oleates) have reduced oxidative stability. When the double bond is attacked, odorous aldehydes and other degradation compounds are formed, resulting in rancid odors. There are ways to handle this problem, such as by hydrogenation and the use of antioxidants. They are offered for commercial use in emollients and other products. Quite often, extra amounts of surfactants must be used to emulsify these large molecules. Quite often emollients are used in combinations. For instance, the widely-used petrolatum forms an excellent barrier but is very oily and greasy. 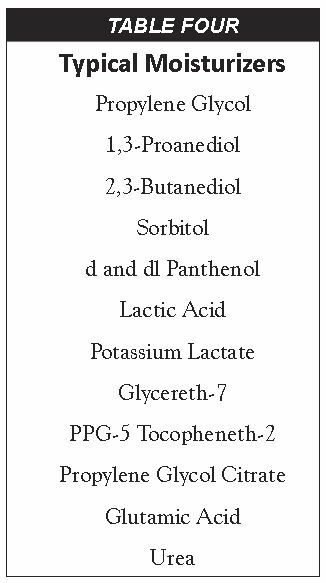 These adverse properties can be reduced by adding myristyl benzoate or caprylic/capric triglycerides, which also improve skin feel and moderate spreading ability. Myristal benzoate is also readily absorbed by the SC. Many emollients, such as ethyl and n.propyl myristate, are not used commercially due to some drawbacks. The straight chain alcohol moiety makes the ester more subject to hydrolysis than isopropyl and other branched chain esters. Others, like the “dimer esters” are large, viscous and sticky molecules. Isopropyl palmitate (IPP), while less costly than isopropyl myristate (IPM), is less preferred because of its slight irritant action. Emollients are generally very safe to use. There may be some rare occurrences of allergic contact dermatitis, irritational dermatitis or pigmentation disorders, but these are ephemeral and of little consequence. the aerosol valve and actuator. Separate listings of emollients and humectants can be found in INCI volumes, although some are not included and a number of compounds are unsuitable for dermal hydration products. 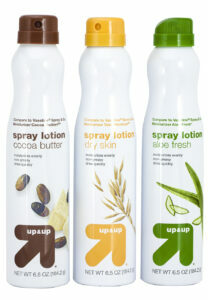 Some other moisturizers may be more effective in combinations of two or more. Urea can be considered as multifunctional in that it can reduce not only dry skin (zeroderma) but ichthyosis, eczema and psoriasis, while also improving the TEWL activity. 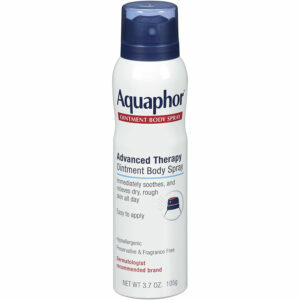 The ideal skin conditioners will reduce dryness and improve the barrier function. The poor ones will deteriorate the barrier operations in normal skin. The products should be utilized proactively to prevent skin dryness from taking place. Most consumers understand this, which explains the large sales volume and preemptive use on healthy skin in addition to diseased skin. In formulating emollient and moisturizer products, other ingredients can be important. For example, non-irritating surfactants should be used, such as disodium dimethicone copolyol sulfosuccinate, polysorbate 20 or Polawax. Potentially irritating surfactants, like sodium lauryl sulfate (SLS) and its iterations, should be avoided. Fragrances should be minimized and selected from hypoallergenic or very mild types. Colorants are generally contra-indicated. Product formulators can obtain valuable information from emollient and humectant suppliers and a look at the ingredient listings on the labels of products can be instructive. Not surprisingly, consumers have many more questions and conversations regarding these products than all other skin products combined—an indication of their importance in addressing skin health and good grooming. The skin is subject to many problems, which often increase with advancing age and exposure to polluted urban air. Most are life-long. Emollients or moisturizers, used daily, can reduce several of these malaises, making the skin smoother, more supple, better looking and less subject to itching and inflammation. Consequently, a huge “cosmeceutical” market has developed wherein combinations of these skin conditioners are sold in the form of creams, ointments, salves and lotions. The usual packaging is jars or plastic bottles fitted with pump-action trigger actuators. Aerosols, Bag-on-Valve (BOV) systems and other pressurized options are continiually entering the market. Emollients and moisturizers are rated for long-lasting efficacy, oiliness, greasiness, spreading, tactile or “cushioning” properties, chemical stability, lack of color and odor, stickiness and (of course) cost. Typical examples are isopropyl myristate (IPM) and glycerin, each used at about 3% to 6%, but sometimes much higher in pharmaceutical skin products. The can is from Exal.